As you can see the company is called "Awaken Realms". They are a big painting studio from Poland, offer comission painting and much more. 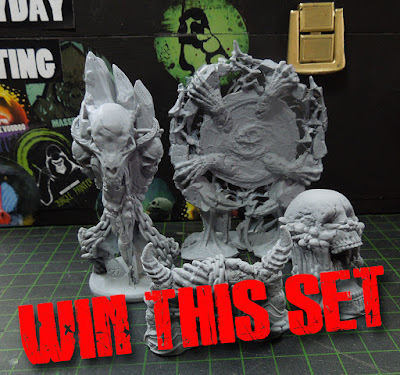 At the moment they are running a Kickstarter mainly aimed at tabletop gamers with bases, terrain sets and objective markers, but after the review you will agree that some of these pieces are very cool for miniature painters too, not only for gamers. 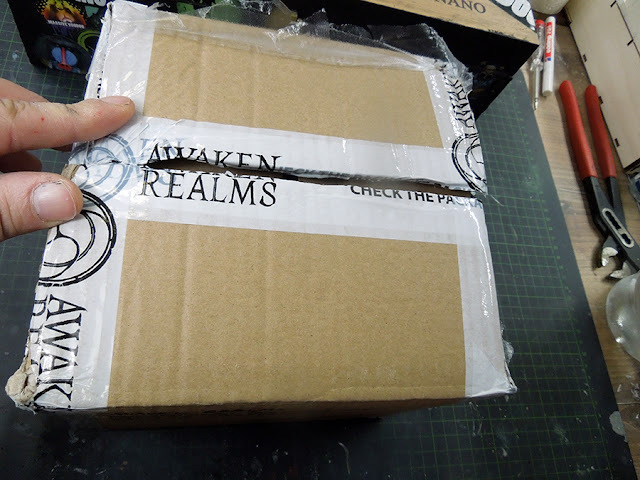 Find Awaken Realms Kickstarter here! Inside the parcel Roman found a metal box which makes everything so cool. Roman loves the packing tape too, something we need to have for MV too in the future. Inside the box we find many pieces wrapped up in bubble foil. 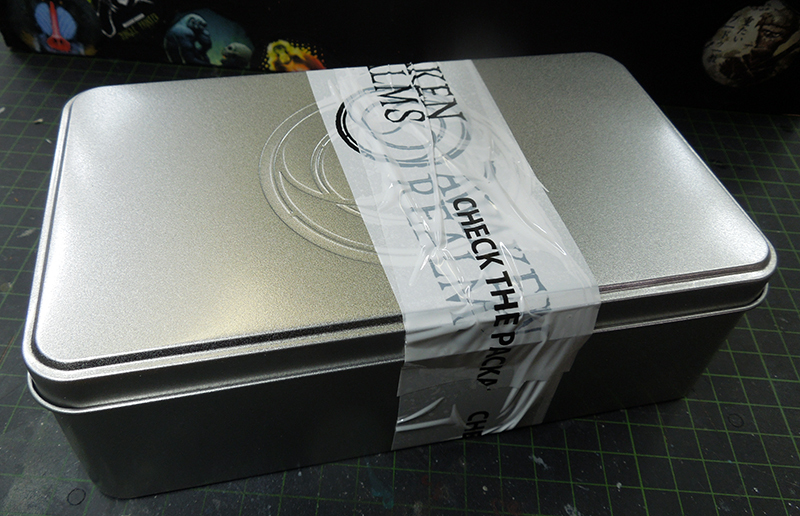 The package is quiet nice with the metal box and everything in it is sound and safe. I am not sure if this format will be the same for the kickstarter, but I had wished the interiour being as impressive as the metal box. For packing there will be three of five available Voodoo points. 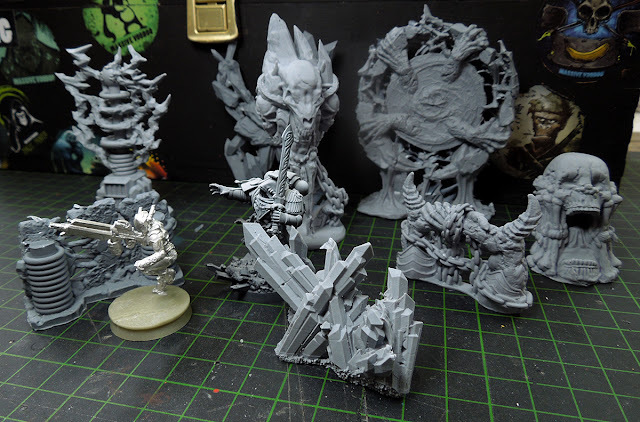 Unpacking them leads to some of the Awaken Realms objective markers, which on first sight can be truely something cool for a diorama. You see different types: "Demon themed", "Tesla-Steampunk-themed" and some floathing crystals for magical moments. What is really cool is that they are mainly all standing on their own, they are balanced. 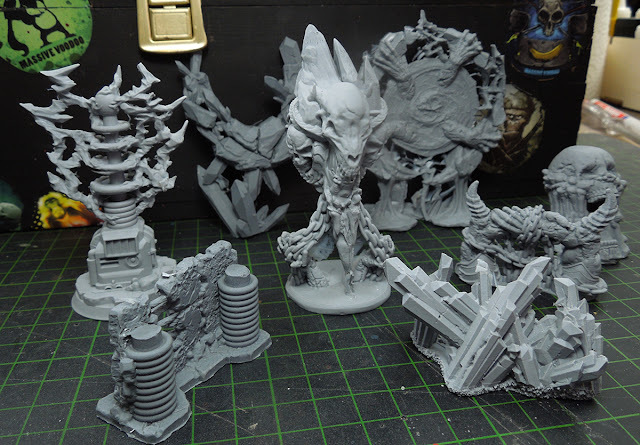 Just the floating crystal in the middle back needs support, but all of the pieces have a solid plattform so you can glue them easily to your bases or gaming landscape. The one that caught my eye was that demon gate with the demon hands that try to pull themselves into reality. A pretty sick sculpt. 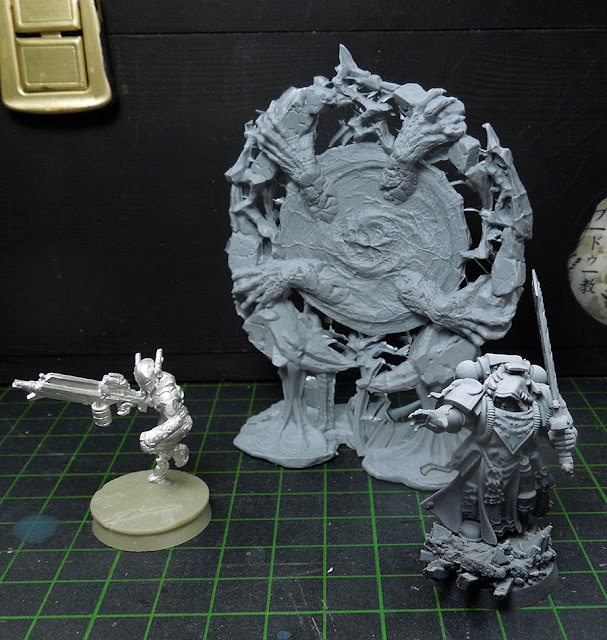 For size comparision you can see a GW and Corvus Belli Infinity Miniature. The concepts and sculpts of these objective markers are really cool and will for sure bring some cool stuff to your gaming table or your diorama idea. 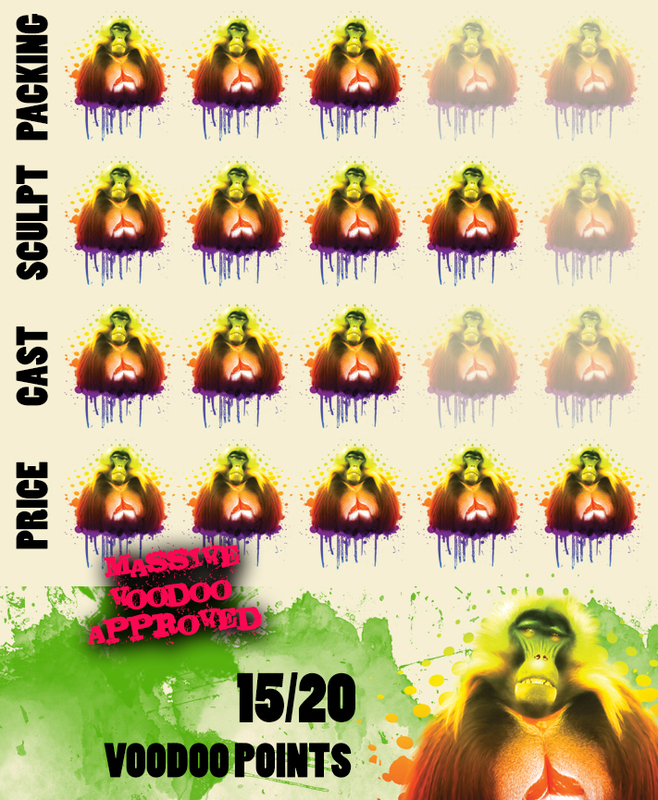 For the fresh sculpts and cool looks MV hands out 4/5 Voodoo points. Now to the casting quality. The pieces were unpacked and untouched, just as they are delivered. As you can see there are several rests from the casting process that have to be cleaned. It's not awful much, but this will take some twenty minutes. There are not much mould lines from the first view, rather more stuff that has to be scratched away. Resin rest. We got the same on the other pieces, but all looks managable with a little time and the right tools. For the casting quality MV hands out 3/5 voodoo points. 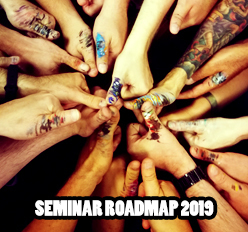 The Kickstarter price sounds really fair for that you are about to recieve several of these pieces if you decided for a pack. It's a fair price if you see the amount of stuff you are getting and to see that this company is also doing everything on their own. From 3D-Sculpting to prining to painting and more. It is also worth mentioning that you can pick only a single set you like and get this one via their Kickstarter. Keep it up! For the pricing of the pieces MV hands out 5/5 voodoo points. Hey you MV readers? Wanna win something? You need patience my friend! No just kidding thanks for the heads up, changed the date! Nice review! 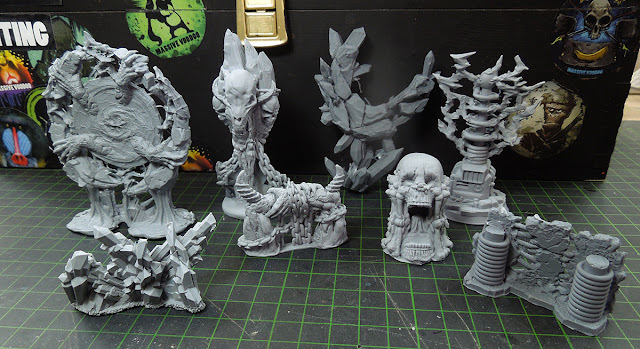 When will you be painting these up? One day in the future if possible. Means if - as we are not gaming - the right diorama for them to use shows up. Oh man, this stuff is sweet! even if I don't win, consider me intrigued! these look great! i may have to get in on the kickstarter! They really look great! Especially the piece with four hands... Using it horizontally (with some changes) will make it a real centerpiece of any gaming table/diorama. i have been following medows arts now awaken realms for a long time, they are a cool team as you guys from massive voodoo. I find the more stationary pieces to be more appealing compared to those with action, like the portal. For display they would look amazing but on the gaming table the piece will get out-shown. They look very cool. 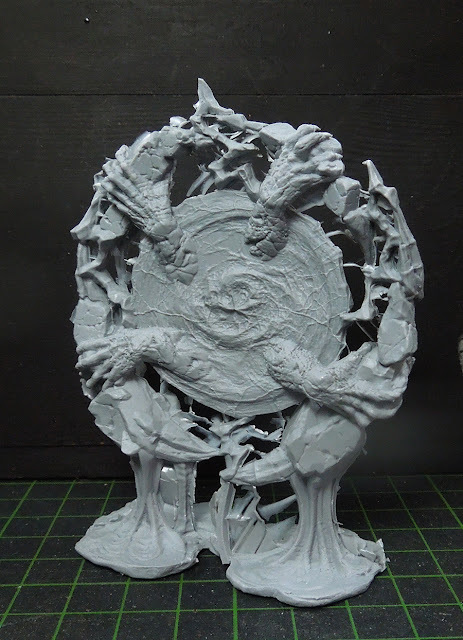 I would love to see some freehands on those portals. And the totems seem appropriate for some orcs! 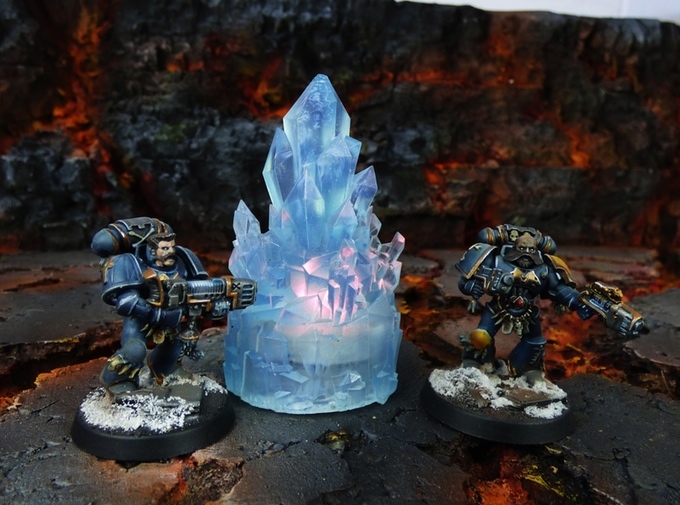 Really great pieces of resin. And good reviev!